Tyke Thodos ordered a new sign for the family cafe soon after taking charge in 1950. He got a beauty. BELOW: Day-time cook Mr. Wong, photographed in 1973 by Nina Raginsky. The bread came stacked on a tiny plate, slices cut thick. On a good day, the supply was replenished as soon as you dipped the last piece into a bowl of chowder. Constantine Thodos, known as Tyke, thought his customers deserved tasty bread, strong coffee, and fresh fish. He supplied all at a reasonable price. 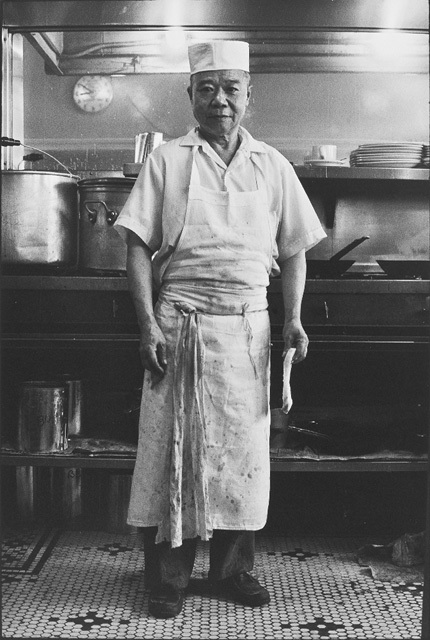 Mr. Thodos took over the family cafe in Vancouver at age 24 in 1950. He was involved in its operation for decades. On his death two weeks ago, aged 84, the city lost a restaurateur deserving of accolades for nurturing an oasis of good eats in a neighbourhood suffering from a long decline. His father had been slinging hash in Vancouver since before he was born. Nick Thodos, who chased gold in the Yukon, became cook and part-owner of the English Kitchen in 1912, likely walking the four blocks to work each morning from his room at the Patricia Hotel. He was eventually joined by his brother, Gustave, who worked as a waiter. The two opened a restaurant of their own five doors west in a former jewelry store at 20 East Hastings St. In those days, the Hastings strip was the heart of the city’s business district, crowded with theatres and new brick office buildings. Their joint boasted a roof of pressed tin and 18 stools around a counter. Patrons crowded the tiny cafe, eager to sample seafoods fried and boiled and steamed with Mediterranean flair by the chef. The brothers named it The Only cafe. By the time Tyke took over, the city’s commercial centre had moved, but the old neighbourhood remained busy with loggers, fishermen and shoppers visiting the nearby Woodward’s department store. The city’s newspaper offices were just a short stagger away. Theatre patrons in their finest dropped in for a snack after the show. Tyke squeezed two booths into the tiny space. He ordered clams from Thetis Island and got the day’s catch from the docks at the foot of Campbell Avenue. The cafe had a four-page cardboard menu, but all you needed to know you could see in the front display windows, where fish rested on beds of ice. The son had been running the place for less than a year when he made a propitious decision by commissioning a sign from Neon Products. He got a beauty of neon tubing and sheet metal painted yellow-gold and navy blue. 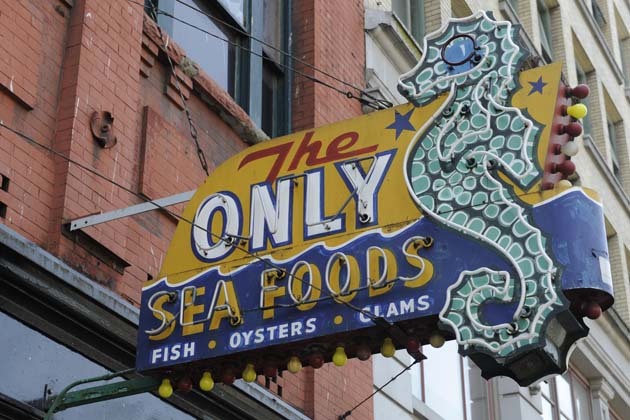 At night, ONLY SEA FOODS was illuminated in an eerie green, while a sea horse, the tail oddly curled in the wrong direction, was lit in orange outline with fiery red eyes. For decades, the sign was a beacon for those seeking an honest meal at a fair price. Tyke operated The Only with help from his brothers. One of them, a chunky athlete named Pete, played professional football. In 1948, Pete traveled to Varsity Stadium in Toronto for the Grey Cup game. With his Calgary Stampeders trailing the Ottawa Rough Riders, by 7-6, the son and brother of restaurateurs was handed the ball. Pete Thodos scored the winning touchdown in Calgary’s first Grey Cup championship. He later played a single game for the B.C. Lions in their inaugural season. 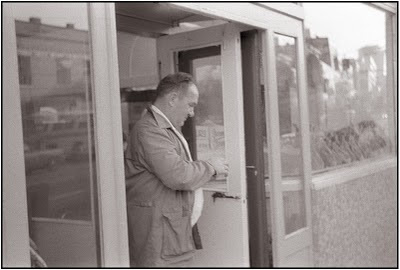 The cafe fed generations of artists, writers and musicians, some of whom became convinced that the cafe’s sweaty, ruddy-faced short-order cook was the model for the cartoon character Reid Fleming, the World’s Toughest Milkman. David Boswell, the illustrator, created the character before coming to the city, but acknowledges a strong resemblance. The artist Keith McKellar, who has written a splendid ode to The Only in his book “Neon Eulogy,” recalls drunks passing out at the counter, only to be awakened by the cook administering a pinch to the back of the neck. The family handed over day-to-day management of the cafe in the early 1990s, as the neighbourhood declined in the post-Expo 86 era. Police discovered open drug dealing inside the cafe and it was closed for health violations 20 months ago. It has been reported the rights to the cafe’s name have been leased to the Portland Housing Society, which has expressed interest in operating a cafe as a social enterprise. Last summer, the spectacular neon sign was removed for repairs and safekeeping. On Friday afternoon, friends and family are to gather at the Hellenic Community Centre to celebrate the life of a man who kept the city fed with pepper chowder and halibut cheeks. Many of the artists and musicians who enjoyed The Only's good eats at fair prices thought the cook a dead ringer for the cartoon character, "Reid Fleming, World's Toughest Milkman." David Boswell conjured the character in his imagination before moving to Vancouver, but went to 20 E. Hastings St. to check out Reid's doppelganger. He snapped this photo in 1983. Wow. This is terrific. I stumbled upon your great blog by accident, by clicking through the "next blog" tab at the top of my own blog. I shall come back deliberately from now on. All best wishes from Boston. never thought of that .. how great this blog. I got something that none other than here. probably not a coincidence. When you have a chance, will you please email me (Johngy1@aol.com). I see you write for the G&M and I had a couple questions I was hoping you might be able to answer. INCREDIBLE !! I am fascinating toward it..what a lovely post. Its my pleasure that I got a chance of reading it. thank a ton !! Nice history information,thank you! Also its nice to see that classic neon sign being saved!!! Really interesting story. I ate there once years ago when a defunct hipster weekly said it was good for cheap eats. I've wondered what it must have been like in better days, when it was a nicer area, so I enjoyed reading this. thanks for the wonderfully post!! !